In my opinion, one of the books of the last century that will be considered as having a great impact on the sport of weightlifting is The Knee in Sports by Karl K. Klein and Fred L. Allman, Jr. The majority of articles and books on weightlifting that have condemned the full squat cite this book as their authority. Considering the number of athletes, serious bodybuilders and fitness trainees in schools, colleges, and public gyms who consider doing full squats the equivalent of a death wish, the enormity of the influence of this book, The Knee in Sports, is apparent. I have a problem with the virtual outlawing of the full squat. Here is why. I was at The University of Texas in the late 1950s and early 1960s when Karl K. Klein was doing his research on the adverse effect of full squats on athlete’s knees. Klein’s bailiwick was the physical rehab room adjacent to the weight room. I had lower back problems due to having been a passenger in a serious car accident in high school, and Karl was more than happy to help with some physical therapy, primarily stretching. I liked Karl and we discussed his views on full squats. In fact, I was one of the lifters tested as part of his research. 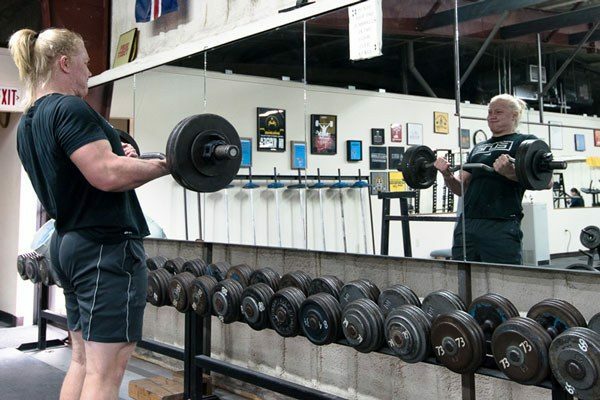 He personally showed me how he recommended weight trainees – specifically athletes – to perform squats. And here is the problem: what he showed me does not even resemble what I see being called a squat in gyms today. The conflict between what Dr. Klein personally showed me and what is believed to be what he wrote has been bothering me for years. After forty-plus years I decided to resolve this conflict once and for all. To get to the bottom of the difference between what was and what is, I went to the horse’s mouth for the truth, Karl K. Klein’s book, The Knee in Sports. Thanks to my good friend Leo Seitz, a copy of this book was located. Leo is the Olympic Sports Strength Coach at Texas State University, and he found a copy in the university library and checked it out for me. The depth of the squat position should be controlled, with the thighs just breaking the parallel position (Figure 7). 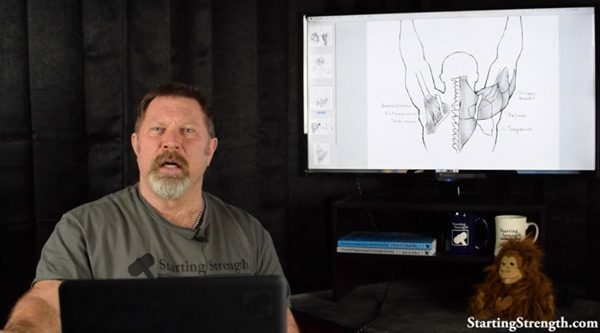 Much beyond this point, the reaction between the hamstrings and calf muscle begins to act as a pry to force the joint apart at the front, as well as on the sides, stretching the ligaments (This problem will be discussed later). “With the thighs just breaking the parallel position,” are the key words. Klein’s influence has been so pervasive, that with the exception of Olympic lifters and a very few in-the-know trainees, I can’t remember the last time I observed an athlete breaking the parallel position. What happened here to distort the truth to an unrecognizable level? As a teenager we played a game called “telephone.” Most of the readers will remember this game, but for those who don’t here is a brief description. One person will whisper a phrase into the ear of another participant in the game. This second person will then whisper into the ear of the next person and so on. The last person will then tell what they heard. It is always surprising and amusing what the last person quotes when compared to the original phrase. I believe this is what happened with what Klein said and what writers and instructors heard; the difference is surprising but not amusing when considering the consequence of this misunderstanding. And the beat went on and on, and now a half- or quarter-squat is the order of the day. If there is one thing I have learned from my many years on this earth is to always go to the source data when someone quotes a research study. Evidently this was not done by a considerable number of writers and instructors who are considered authorities on exercise. Now you know the truth. If squat type exercises are used the weight should be kept in front (Figure 6). Even though it may not be possible to use as much weight, the exercise is safer and puts much less strain on the low back. In other words, he favors front squats over back squats and states the reason. 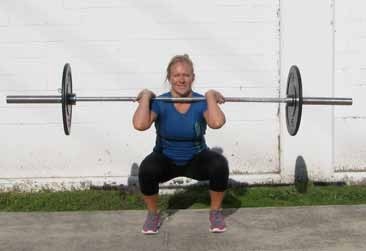 My belief is that an Olympic weightlifter should perform both back and front squats usually, but not always, on separate days, while realizing that the correctly performed back squat is the primary exercise. The author continues with additional suggestions that, I believe, are worthy of consideration. The knees should be kept straight forward in the squat action and the toes should be kept directly beneath the knees or slightly inside. This allows the normal relationships to be maintained between the femur and tibia in the flexion movement. If the knees are slightly spread in the squat action the toes may point out slightly (as shown in figure 8) but still should not be beyond the knee. This is a point that should be considered – the lifter should avoid allowing the knees to come together as he recovers from the bottom squat position. The quadriceps are part of the hip flexors (along with the iliopsoas) and normally tend to tighten as a result of constant activity. Daily stretching exercise should be included for these muscles to maintain flexibility and range of motion. Figure 12 illustrates the stretching process (left leg): hips are shifted forward, abdominals kept tight, the body is erect and the forward knee bends slightly to cause the opposite rectus to stretch. This MILD STRETCH should be held for 20-30 seconds and ten relaxed. The exercise should be repeated four to five times daily. The stretching should be duplicated on the opposite side. As flexibility is gained the leg being stretched can be raised to a higher level. This higher level should not be used in the beginning because the rectus tension causes the pelvic girdle to be pulled down and forward, and raising the leg too high causes too much back arch. I believe this is good advice, as stretching is an often-neglected segment in training programs. A stretching program that encompasses the whole body should be a regular part of every trainee’s regimen. To summarize: Back squats that break parallel are safe for the knee and should form the basis of your training. 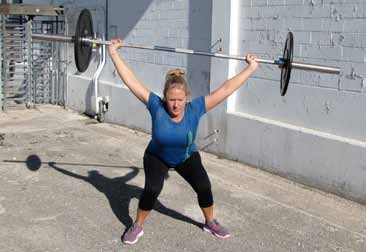 If you are a weightlifter, do both front and back squats unless there is a problem that prevents you from performing one or the other. Place the heels about shoulder width apart, toes at a 30 degree angle and go slightly below parallel; avoid bringing the knees together as you recover from the bottom position. 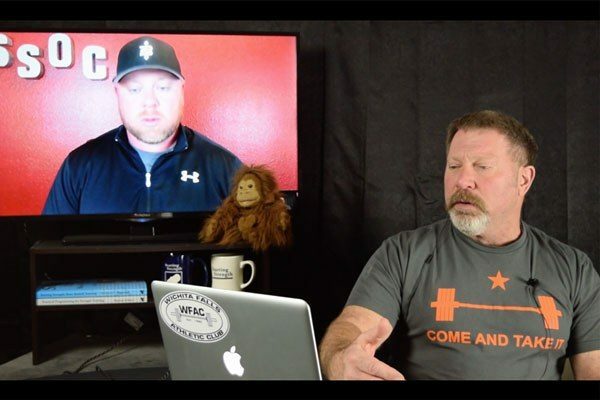 There is no research that proves going below parallel when performing a squat is detrimental in any way physically, certainly not the research done by Karl Klein and reported in his book, The Knee in Sports. Don’t play telephone with the facts. The following photographs should help you to understand and visualize what K.K. Klein described in his book. These pictures and their captions duplicate those used in his book. My belief is that these photos will stand a direct comparison and the reader is invited to see for themselves that these illustrations are true and accurate. The figure number used is the same as Klein used in his book; the page number is also given. The lifter illustrating these positions is Amber Heitkamp. Figure 1. 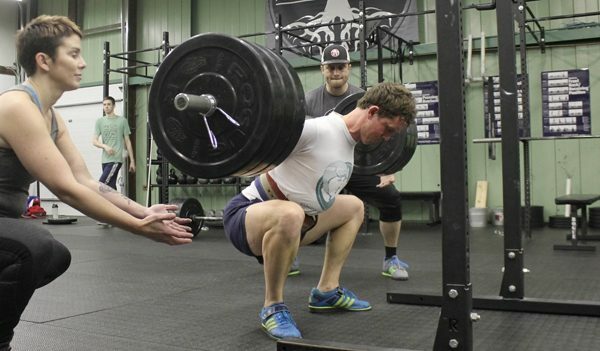 The low position in the squat, with the thighs just breaking parallel, that a trainee should reach before recovering to the standing position. This picture duplicates the one used by Karl. K. Klein on page 30 of his book, The Knee in Sports. 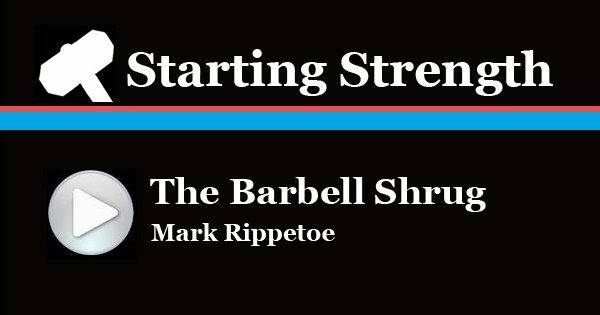 This bottom position in the squat is the same as the drawing on the cover of Mark Rippetoe’s book, Starting Strength (Third Edition). Note that the knees are over the toes and represents the position recommended by both authors. Figure 2. 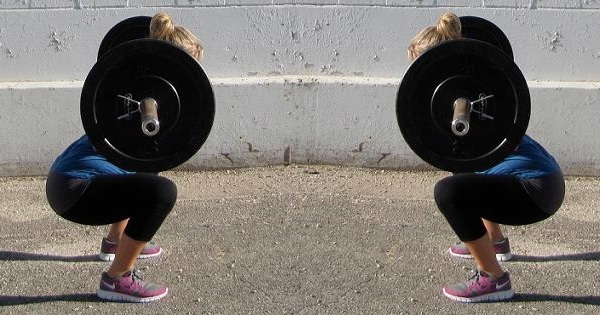 The front squat recommended by Klein because it puts less strain on the lower back. 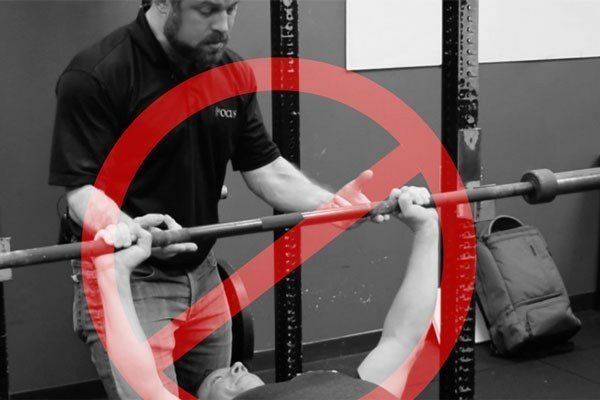 However, he did not say that a trainee should not do back squats. The lifter demonstrates the foot position recommended by Klein, pointing straight ahead. However, he states that the foot position with the toes pointing slight out, approximately the 30 degrees suggested by Rip in his book, is acceptable. Figure 3. A definite practice to be avoided – allowing the knees to pull together when recovering from the bottom squat position. Doing so, according to Klein on page 57 of his book, is responsible for the stretching of ligaments and for other knee irritations due to the knee working in opposition to the normal mechanics of the joint function. Figure 4. On page 41 of Klein’s book, illustrating the stretching exercise he recommends to maintain flexibility and range of motion of the quadriceps.